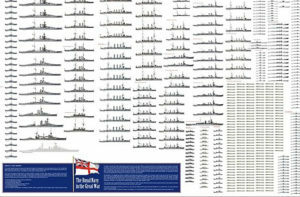 These two impressive vessels outside purely technical aspects, perfectly embodied the British naval supremacy as navigating symbols, both in quantity and quality. 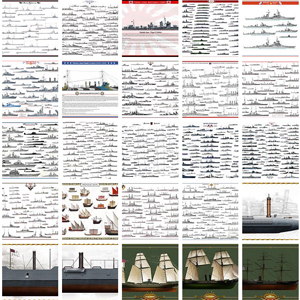 Real military ships, they were in fact retrospectively regarded as of “great white elephants”. Their construction at Vickers, Barrow in Furness and J&G Thompson, Clydebank cost around £740,000 in 1894–98. 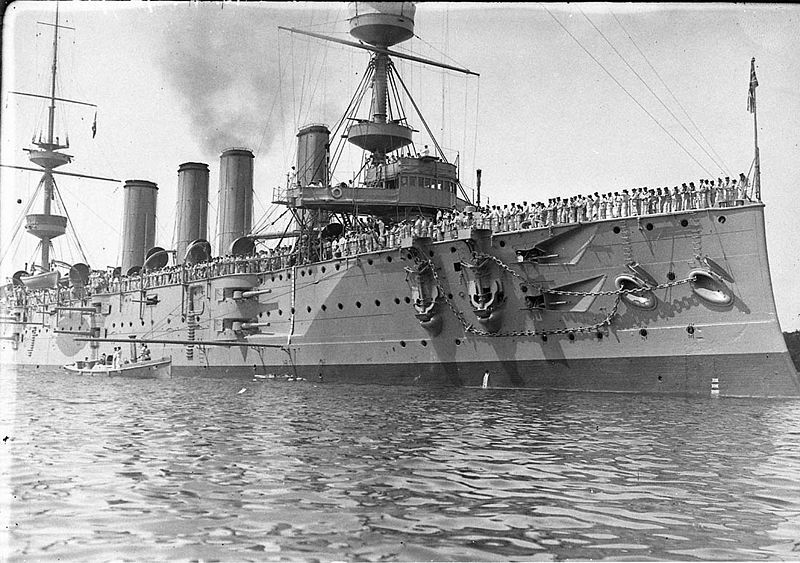 These were to answer the two impressive Russian cruisers Rossia and Rurik, then certainly among the largest warships afloat. 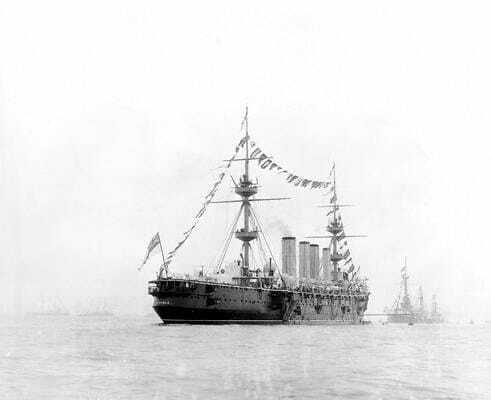 In fact, upon completion in 1897 and 1898 (with a construction span of 4-5 years), they took over the torch of largest warships in the world. 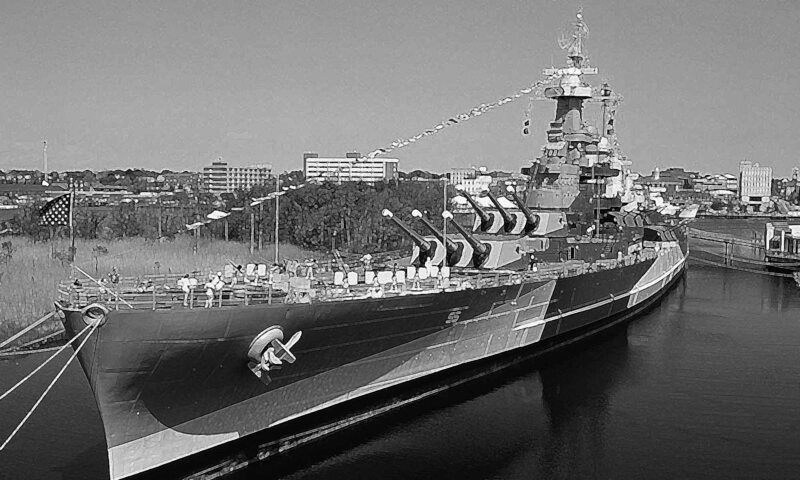 Tellingly named “Powerful” and “Terrible”, their displacement was double of previous cruisers, Edgar class, and accordingly cost twice. Their crew was nearing 900, giving them a more expensive maintenance. 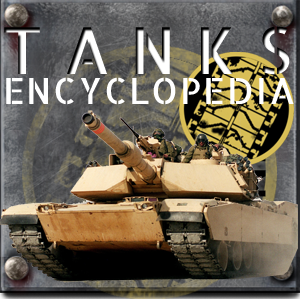 Technically, they were the first ships of this size to employ water tube boilers of the Belleville type, which raised concerns about their development and accumulated teething problems. Despite this, their machines gave them a satisfactory rate, keeping them efficient steamers throughout their length of service. After testings, their four chimneys (a first in the Royal Navy) appeared too short and therefore had to raise to five meters to avoid clouding the observation points. Their roomy configuration with three bridges made them much more livable quarters, although their weapons distribution remained classic: They had only two 152 mm cannons, but two twin 234 mm in turrets rather than protected by shields, and for the first part the 152 mm were barbettes spread among two levels. All their artillery was thus perfectly protected. For the rest, their size did not asked for only a similar armament to previous ships, and in 1904, four 152 mm cannons were added to the upper deck. Their speed was higher by 3 knots than previous ships, and because of a 3000 tons of coal surplus, their autonomy was also much higher. Not quite agile due to their very long, high and buoyant hulls, there were however recognized as good sailors and walkers. Early in their careers, the two ships were based in China, then rallied South Africa to carry troops and support infantry companies. In 1899, they made the big titles of newspapers when landing vanguard troops to support Ladysmith during the Boer War. 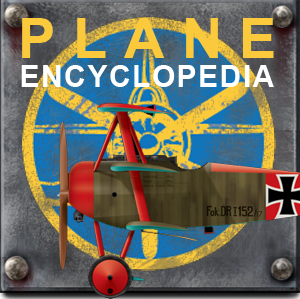 In 1902-1904 they were the subject of a small redesign and were set aside as being considered too expensive for service. 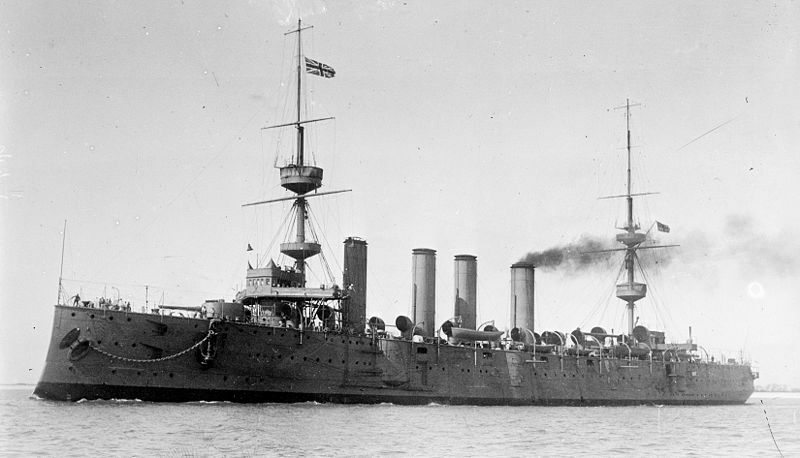 Only in 1915 HMS Terrible was reactivated, used as a troop transport. She rallied the Mediterranean, then returned in reserve at Portsmouth, reclassed as an utility ship at anchor until 1920. Renowned Fisgard III she then served as a training ship until 1932. 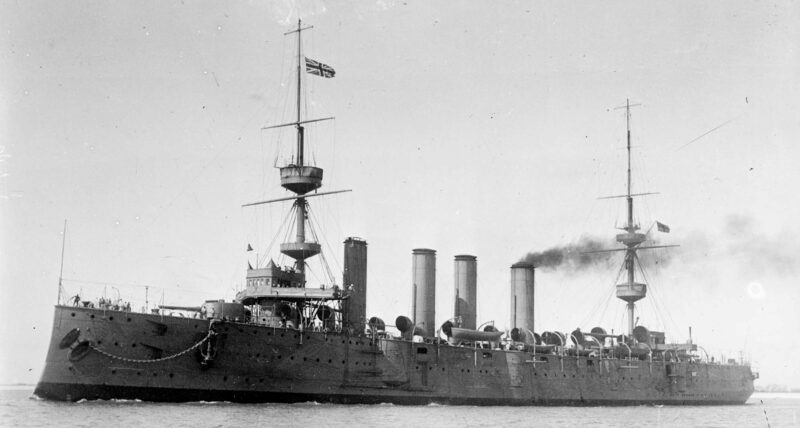 The HMS Powerful came out of the reserve in 1915 to serve as a training ship in Devonport. Her vast dimensions made it well predestined for this new duty. She continued this service from 1919 under the name Impregnable II until 1929, before being stricken, sold off and later broken up. 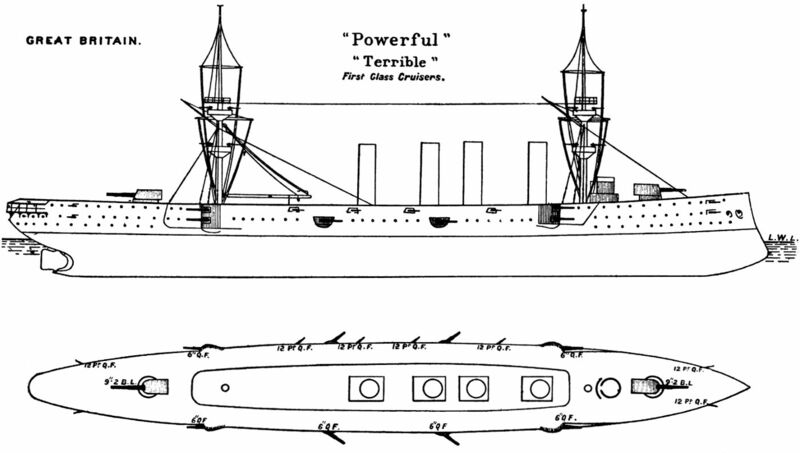 HMS Powerful illustration in 1914. 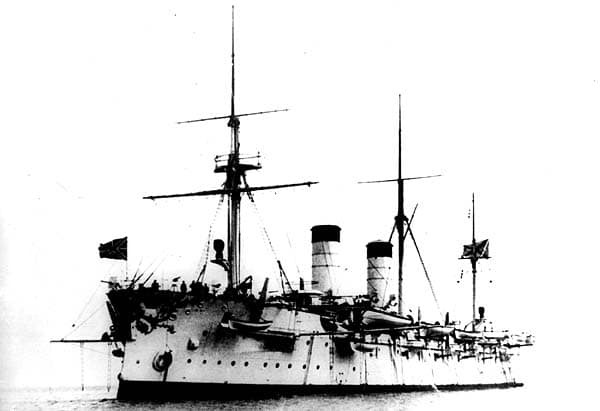 The opposing Russian cruiser Rurik.